There are several home remedies for dog ear infections that provide a safe and natural healing process. When your dog is suffering from an ear infection, whether it is mild or severe, it can cause pain and discomfort, and even permanent damage if it is left untreated. Many home remedies can be found around the house or purchased for a low cost. 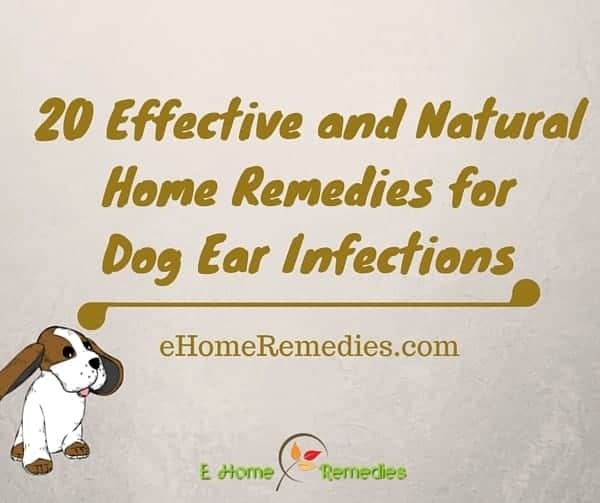 In addition to being natural, these home remedies are highly effective which means your pooch will be relieved of the symptoms that are associated with an ear infection faster. The different types of ear infections all have different causes. Some ear infections are caused due to being directly related to the breed while other types of ear infections can be seen in any dog. It is important to understand which type of ear infection your dog is showing signs or symptoms of so you can find the cause, and therefore, the appropriate home remedy to use. Bacteria which thrives in a humid environment, such as the inner ear canal. A scratch or cut within the ear that becomes infected with bacteria. Predisposition to acquire an ear infection. For example, if your puppy or dog has floppy ears, the limited air flow or the amount of hair can allow for dirt or debris to become lodged in the ear canal. The build-up of any dirt or debris can lead to an ear infection. It is important to remember to check your dog’s ears once per week if your dog is a breed with floppy ears. Allergies to foods or their environment. When food allergies are not properly addressed or noticed, the bacteria Candida can begin to grow and spread. Food allergies can be triggered by inappropriate, toxic and otherwise heath threatening ingredients in dog food that is store bought and/or veterinarian prescribed, or dog health care products. Health care products that can cause ear infections are: dental chews, toothpastes, shampoos or rinses, store bought or veterinarian prescribed chemical based insect and parasite preventatives. A suppressed immune system (this will enable bacteria and fungus to grow). This is caused by vaccinations or over vaccinations and/or other immune-suppressing medical conditions. Catching ear mites from another animal such as a cat, rabbit, or another dog. This is the most common way for a dog to become infested with ear mites. Particulate blowing about in the wind can impact and lodge into the ear canal. For example, this can occur when a dog sticks his/her head out the window of a quickly moving vehicle. When running through or rolling-in certain grasses that have hard seed-bearing seed heads; Some types of seed heads have sharp points and microscopic barbs that can become lodged in a dog’s as they run through, play or roll-about in the grass. These barbs can easily work their way into flesh – the barbs then prevent the seed head from working its way back out. Hard seed bearing grasses are often referred to as ‘Fox Tails’. Dogs that commonly swim in lakes, ponds, the ocean, or swimming pools are prone to having ear infections if their ears are not dried appropriately once they have finished swimming. Although there are several types and severities of ear infections in dogs, the signs and symptoms for each will be similar. If you notice that your dog has any of the following signs or symptoms, it is ideal to get their ears checked by a veterinarian so you can seek the appropriate treatment method. It is important to check your dog’s ears as often as once per week in order to keep them clean and notice any signs or symptoms from ear infections as early as possible. The sooner you can recognize that your dog is showing signs or symptoms of an ear infection, the sooner you can begin treatment. Ear infections in dogs are painful and can become a serious, permanent problem should they be left untreated. If you have noticed the signs or symptoms that indicate your dog is suffering from an ear infection, it is important to have a veterinarian to check the ear canals to properly diagnose the condition. After you have had a vet take a look at your dog’s ears, you can be sure of the type and severity of the ear infection. This will allow you to choose the right natural home remedy for your dog’s ear infection. Before you begin any treatment regime, you will need to cleanse your dog’s ears thoroughly. Cleansing your dog’s ears will remove any dirt, debris, or waxy buildup which will enable the treatment to reach the infected areas of the ear canals. In order to properly clean your dog’s ears, you will need a few things that can be found around the house. Gather the following items so you can cleanse your dog’s ears safely. Similarly to the importance of cleaning your dog’s ears before administering home remedies, you will need to be aware of how to do so in a safe and comfortable way. Please refer to the following guidelines before beginning any treatment. Make sure that any drops are at room temperature or slightly warmed before administering. If the drops are too cold or too hot when placed into your dog’s ears, they can cause a shock and discomfort as well as make the infection worse. Drying your dog’s ears should be done with cotton balls and you should wipe them with a gentle sweeping motion. Gently rub or massage the base of the ears and then allow for your dog to shake its head. This will allow the treatment to go deeper into the ear canals. The following home remedies for ear infections in dogs can be used on any breed of dog, just make sure to check with your veterinarian before beginning any treatment methods. 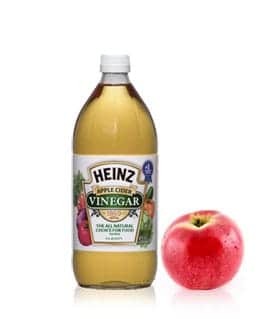 Apple Cider Vinegar is a powerful antibacterial agent and can be used undiluted, just as long as your dog does not have any lesions or open wounds in the ears. If your dog does have a few open wounds in the ear, you can dilute the apple cider vinegar with distilled water. It is highly important that you do not use pasteurized apple cider vinegar as it no longer contains the medicinal properties that can heal an ear infection. Organic apple cider vinegar has anti-bacterial, anti-fungal and anti-viral properties (primarily from the acetic acid and malic acid in apple cider vinegar). Whether you need to dilute the apple cider vinegar or not, you will need to place up to ten drops into the ears. You will need to do this once per day for at least two weeks. Apple cider vinegar can become a part of the daily routine as it is safe and combats against bacteria growth in the ears. This is especially recommended for dogs that suffer from chronic ear infections. Calendula is an herbal remedy that has anti-fungal properties. You can find calendula tinctures at most natural health food stores. Calendula ear drops not only help cure the infection, it is useful for healing wounds inside the ears as well. 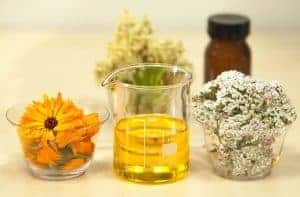 To make this mixture, you will need to combine one Calendula tincture with ½ teaspoon of sea salt and 1 cup of warm distilled water. Once you combine the ingredients you will need to place ten drops inside each of the ears once per day. Depending on the type or severity of the ear infection, you will need to continue this treatment for at least ten days. Garlic has a broad spectrum of antibacterial, antifungal, and antimicrobial properties and is widely used to fight a multitude of infections. Garlic contains allicin which will be drawn out from the garlic once it has been crushed. The allicin is the main property in garlic that fights infections. 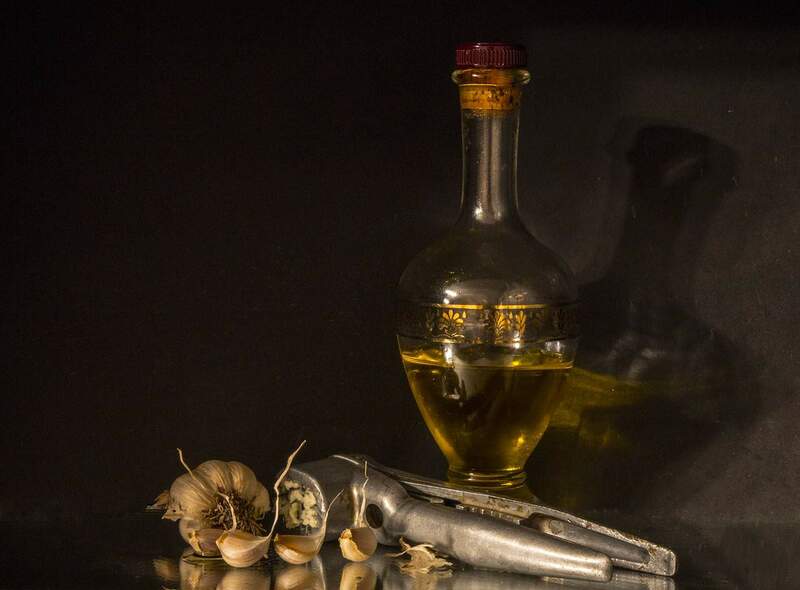 Garlic oil can be used to keep ears clean, treat bacterial of fungal infections of the ear, eliminate ear mite infestations, and treat inner ear fluid and inner ear swelling. To make the garlic oil drops you will need to gather organic garlic, virgin olive oil, cheesecloth, a clear jar, and a dark colored storage jar. You will need to thinly slice the garlic cloves and add to the clear jar. Pour the oil over top the garlic, completely covering it and leave some space at the top of the jar. For infection and mites, give your dog 10 drops in each ear twice daily, until the infection/infestation is resolved. For maintenance and cleaning give your dog 10 drops in each ear once a week to once a month as required to keep the ears clean. Mullein has anti-microbial and anti-viral properties and garlic is a natural anti-biotic. 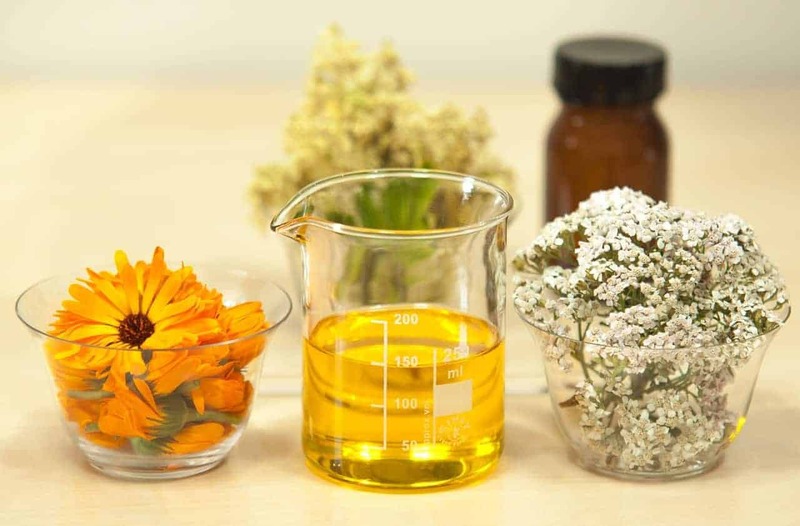 When you combine the two oils for one treatment, you can be sure to have a fast recovery. To make this mixture you will need to combine equal parts mullein and garlic oils. For every ounce of combined garlic and mullein oil, you will need to add 10 to 20 drops of olive oil, vitamin E, or almond oil. Once you have added the three ingredients, you can place up to 10 drops in each ear until the symptoms have been relieved. Silver is a natural and powerful antibiotic agent and speeds healing in wounds and infections. 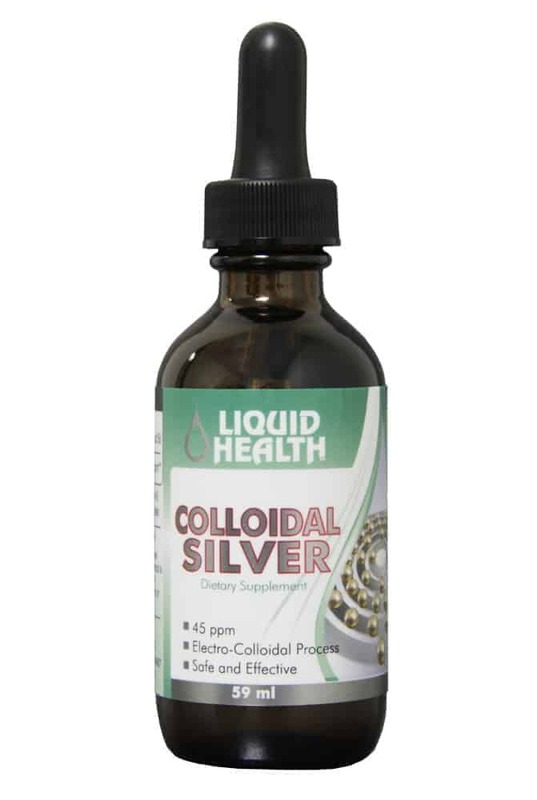 Colloidal Silver has excellent antiseptic, anti-fungal and disinfectant properties and can be found in tincture, gel caps, or water form at almost any health food store. You will need to give your dog 10 drops of colloidal silver in each ear, once per day throughout the duration of the infection. This remedy can be used on mild to severe cases and is helpful for dog’s that also have open wounds in their ears caused by scratching during the infection. Oregon grape herb has multiple properties that help to combat an ear infection and/or an infestation of mites. 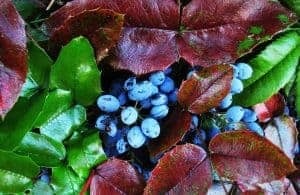 These benefits of Oregon Grape include – antibacterial, anti-fungal, antimicrobial, anti-inflammatory and antioxidant properties, and due to the high amount of benefits, Oregon Grape is readily available at many health food stores. The wide range of powerful agents within the Oregon Grape make it an ideal home remedy for all types of ear infections. You will need to combine 1 teaspoon of Oregon Grape tincture with 4 ounces of warm distilled water. Once you have made the mixture, apply 10 drops into each ear once per day for at least ten days. Green tea drops can help soothe a swollen or irritated ear caused from an ear infection. 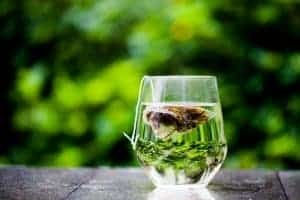 Simply add two organic tea bags or two teaspoons of organic loose leaf green tea to 8 ounces of boiling water. Allow the tea to steep for no more than four minutes and cool. Apply about 10 drops twice daily to irritated ear. The antioxidants in the green tea will help to reduce inflammation and also keep the ears clean. This remedy is ideally used in combination with other powerful remedies and can be used on dogs with any type of ear infection. This loose leaf herbal tea can be found at health food stores and is known for reducing irritation in the ears caused by the ear infection as well as stop inflammation. 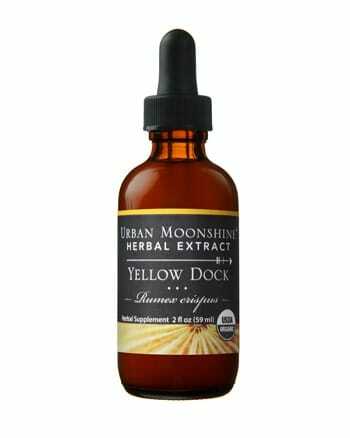 To make these drops you will need to add one tablespoon of dry yellow dock root to ½ cup boiling water. Allow the tea to steep for 3-4 minutes and cool. Once the tea is cool, strain it so that the fluid is clear and free of particulate. You will then give your dog 10 drops in each ear, twice per day for about ten days. This remedy is also useful when combined with other types of home remedies as it is gentle and able to be used on any type of ear infection. Boric Acid is widely used for inhibiting growth of bacteria as it is a very powerful remedy. 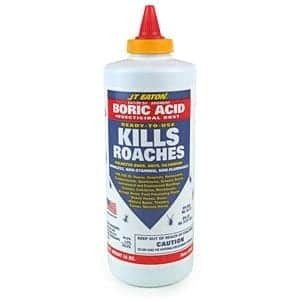 Boric Acid can be purchased at any health food store and is highly effective and fast when it comes to treating infections. You should place 2-5 drops in each ear for minimum of five days to relieve symptoms and cure ear infections. A study performed by the University of Melbourne showed that infected dogs will recover within fourteen days. Over the course of 14 days, dogs were given 3ml of a solution that contained 2% Boric Acid. Owners were asked to apply the solution once daily for the first seven days and then twice daily for the following seven days. Statistics showed that 95% of the dogs that received this treatment had fully recovered from the signs and symptoms associated with the ear infection. Pulsatilla is an herbal remedy that can soothe irritation and discharge caused by an ear infection. This flower naturally and gently moisturizes and cleanses the dogs ears while at the same time, allowing for discharge to become dispelled. It is recommended to use this treatment in conjunction with another home remedy. 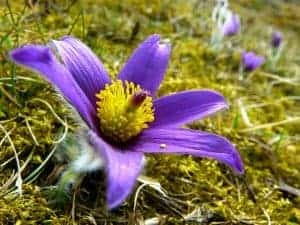 To use Pulsatilla, you will need to administer 10-15 drops into the dog’s ears, once per day throughout the period of infection. When combined with another home remedy, Pulsatilla can quickly and gently soothe your dog’s ears. Gentian, also known as Gentian Violet, can help to cure your dog of an ear infection, as it is a powerful antifungal agent. 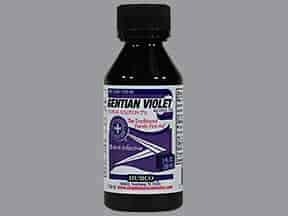 Gentian Violet is a purple dye which helps to dry up moisture in the ear and speed up healing while killing bacteria that may cause a secondary infection. Using this remedy is ideal for dogs that have mild to severe cases of ear infection and Gentian can also be used as a routine preventative ear cleaning solution. Up to 10 Gentian drops will need to be given in each ear, twice per day for up to two weeks, depending on the severity of the infection. 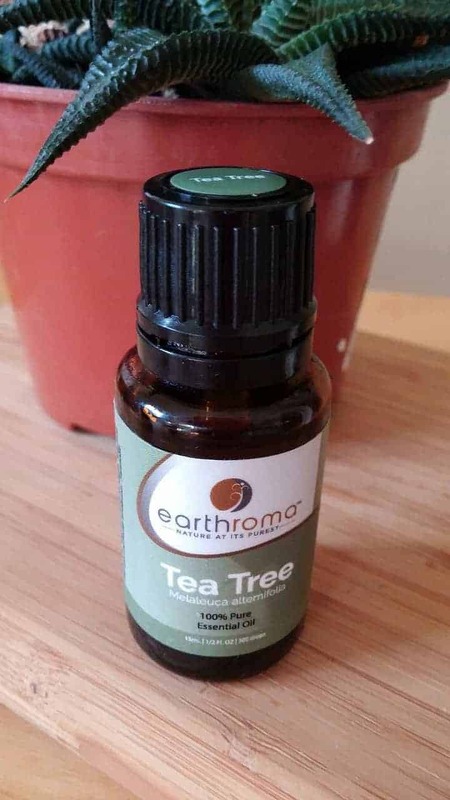 Tea Tree Oil is a powerful topical anti-fungal and anti-bacterial agent. Tea Tree Oil drops can be applied to the dog’s ears, up to twice per day to cleanse, disinfect, and heal the ears. 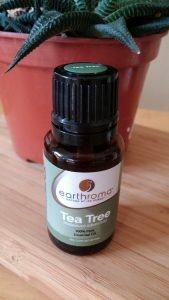 Not only does tea tree oil appear to be a highly effective germicide, but it often relieves the itch and swelling that can accompany ear infections. At least 8 Tea Tree Oil drops will need to be administered in each ear for a minimum of ten days, twice per day. Take care to not over use the tea tree oil or get the oil in your dog’s eyes as it can cause further irritation. Nearly every household will have white vinegar within reach. White vinegar is a strong antibacterial and antifungal agent and can help relieve your dog of symptoms and even cure mild ear infections. 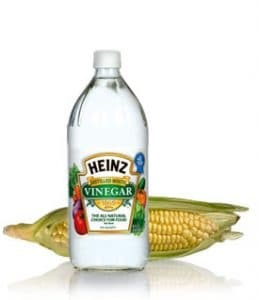 You will need to combine two parts white vinegar to one part water. Ensure the mixture is at least at room temperature, if not slightly warmed as a cool mixture can damage the ears further. To administer the mixture, hold your dog’s head to the side and pour at least two teaspoons inside. You will need to massage at the base to ensure it reaches the ear canals. Diluted white vinegar can be used twice per day for a minimum of seven days, depending on the severity of the ear infection. A simple warm compress can help relieve your dog of the pain and swelling in the ears caused by the ear infection. This can be used for any type of ear infection, no matter how severe, and can help ease and comfort your dog, even for a few minutes. Apply a warm compress to cure the outer ear infection as it effectively treats the associated symptoms like redness, pain, inflammation and irritation of the ear. 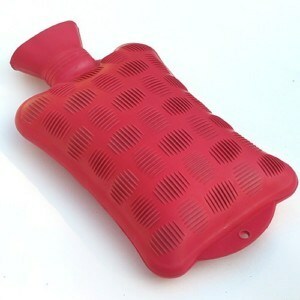 First, soak a towel in hot water and squeeze the excess water. Hold the towel and press gently on dog’s ear. Repeat this remedy several times a day for the best results. 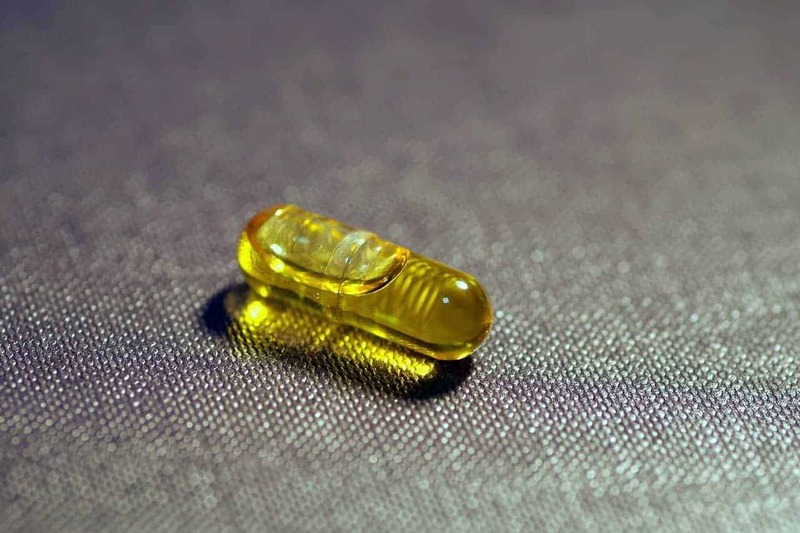 Vitamin E or Cod Liver Oil can be useful in healing inner ear and middle ear infections. You can crush a vitamin E tablet and mix it with warm water and place at least five drops into each ear, twice per day for minimum of ten days. The Vitamin E will help to stop the growth of the bacteria and soothe any irritation. 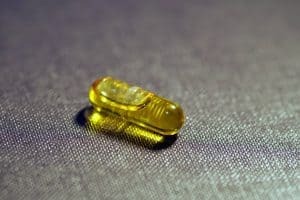 Similarly, 1-2 Cod Liver Oil drops can be used for the same treatment regime, and they will produce the same results. The antimicrobial properties of Margosa are commonly used to cure ear infections in dogs. Margosa oil works best when it is combined with a few other ingredients and you can prepare an herbal ear cleaner by mixing ½ teaspoon eucalyptus oil, 1 teaspoon tea tree oil, ½ oz. olive oil and 1 oz. margosa oil. Put 10-20 drops of this ear cleaner into the ears, once per day for two weeks. This remedy will soothe the inflammation and provide relief of symptoms. Margosa oil can be used on any type of ear infection, but works best when the case is mild. Often referred to as natures ‘Neosporin’, Witch Hazel has a wide range of healing effects while at the same time is highly antibiotic. 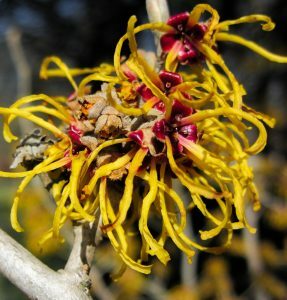 Witch Hazel can be used for any type of ear infections as well as any open sores or wounds your dog may have from scratching the ears. This gentle herbal remedy will soothe irritation and redness, yet is still powerful enough to kill any present bacteria and prevent further growth. You will need to administer up to 10 drops twice per day for at least one week to see results. Many times this remedy will cure ear infections, but treatment time will vary depending on how severe of an infection your dog may have. Aloe Vera gel, whether it is from a bottle or directly from a plant, is great for soothing irritated skin. You will need to warm up at least one teaspoon of aloe Vera gel and use cotton swabs to apply into the ears. This remedy can be used two to three times per day during the ear infection. 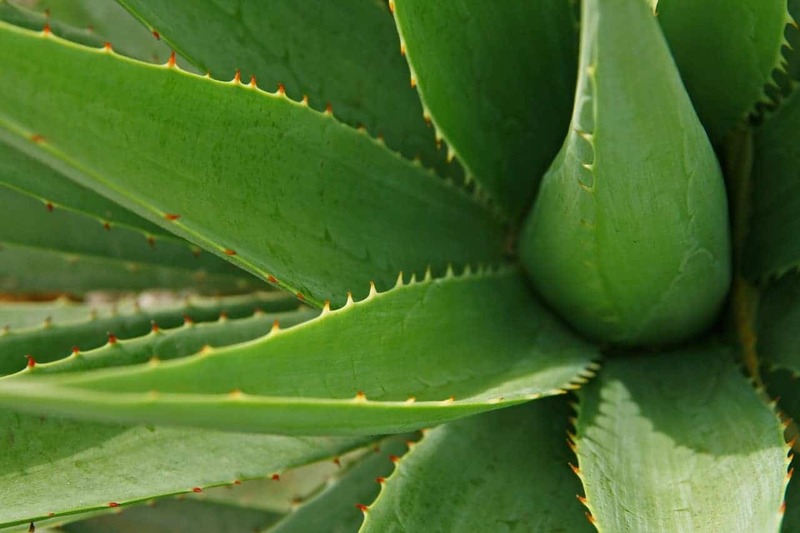 Using aloe Vera will cure redness, itching, and irritation caused from the ear infection. Since it is a great remedy for relieving the symptoms associated with an ear infection, you should use aloe Vera gel in combination with other more powerful home remedies in order to fully cure an ear infection. The soothing nature of the aloe Vera gel allows this remedy to be used on any type of ear infection, no matter how severe. Pau d’arco is a strong herbal remedy found in the rainforests of South America and is used as an antibiotic as it kills the infection causing bacteria and fungi. Pau d’arco comes in several different forms such as tincture, liquid, tablets, soft gels, capsules, powder, herb, ointments, and tea. Due to being used for several human conditions Pau d’arco can be found in a wide variety of health food stores. In order for your dog to fully receive the benefits of Pau d’arco and therefore be cured of their ear infection, you will need to combine equal parts of mineral oil and pau d’arco. 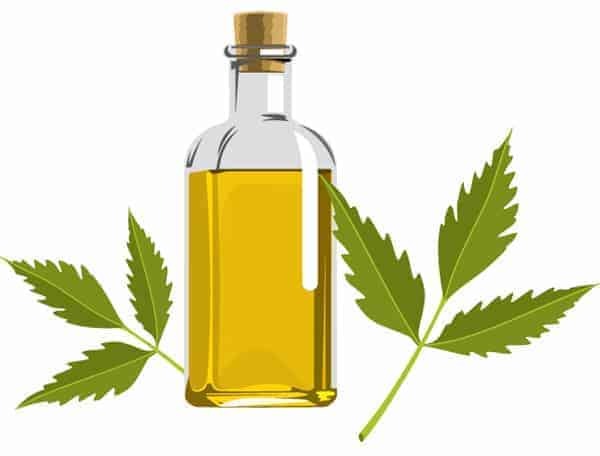 Massage the ear with this oil two to three times a day. You will need to use this oil for a minimum of two weeks to see results. Pau d’arco can be used as a treatment for mild to severe cases of ear infections. These herbal remedies can allow for a safe, natural, and effective healing process. Many home remedies are quite gentle while still being able to be powerful enough to kill bacteria and inhibit further growth. It is important to remember to check your dog’s ears often, at least once per week, especially if you have a breed that is prone to ear infections. When you are checking your dog’s ears, look for signs of abnormal discharge, odor and/or redness. You will need to take the time to gently cleanse your dog’s ears as this is a preventative method. If your dog’s outer ear appears dirty, clean gently with a cotton ball or cotton swab that is dampened with a solution suggested by your veterinarian. Your veterinarian can make recommendations on how frequently you should clean your dog’s ears, as breed, age, and environment will be factors for frequency. For breeds that have lots of hair in the outer ear canal, it should be removed. A groomer can do this, or you can ask your veterinarian to show you the proper technique for removing the hair safely. You should also ensure that you dry your dog’s ears properly if they have been swimming or recently bathed. If your dog is showing any of the symptoms described above, he or she should be seen by a veterinarian as soon as possible. Ear infections can be very painful and if left untreated can harm both the ear canal and middle ear or even cause permanent hearing loss. When you are given a diagnosis, you can then seek treatment using one of the many natural remedies.